Have you ever noticed how different honeys have different colours and taste? That’s all down to how, and where it is made. Like wine, each honey has its own distinct flavour. If you’ve ever been to a wine tasting session, you’ll know how easy it can be to distinguish between wine. For instance, one red wine could be very smokey, whereas another, may have rich berry notes. If you were to have a honey tasting session, you’d also be able to really recognize the differences. Unlike wine, the taste is not related to the variety of bees, instead it’s determined by what plants the bees collect nectar from. Nectar from alfalfa and sweet clover plants are primarily what gives our raw honey its mild, sweet flavour. Some honey producers across the world, have vast fields of lavender near their hives, and that gives their honey a very distinct aroma and taste. Wine’s colour is largely dependent on the colour of grapes used to create it. Honey’s colour is, again, largely dependent on the type of pollen and nectar used to create it. 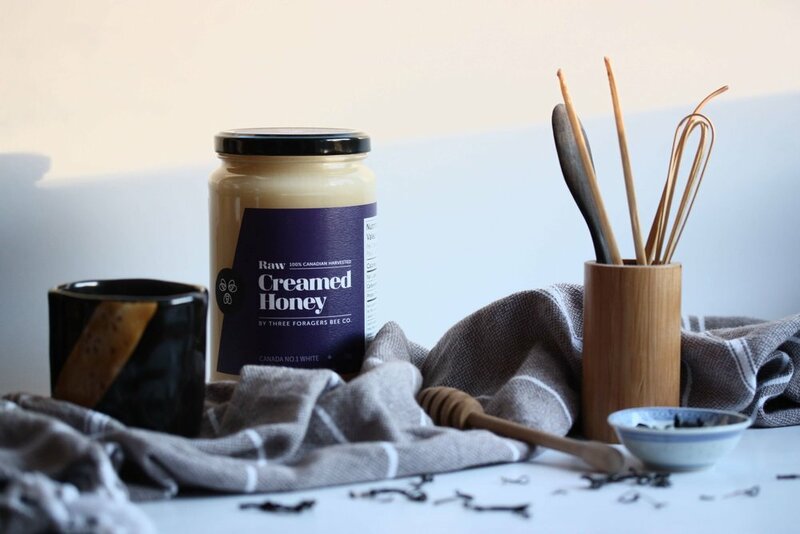 Lighter honey, like ours, tend to have a softer taste and darker honeys are much stronger. Some dark honeys can be a mix of honey from several different locations, which can be why it has a more powerful flavour. A honey tasting night can be a creative way to enjoy time with your friends. You’ll get to appreciate the intricacies of honey, and all of the hard work that our little bee friends put into creating it. If you want to show off, try reciting how we’d describe our raw honey. The honey has a very light colour, a result of the alfalfa and sweet clover nectar from the Saskatchewan prairies the Three Foragers bees visit. On first taste, you instantly notice this is a much more delicate flavour than the majority of store bought honeys. Despite the mild flavour, there is a decadence that could almost be described as creamy. It would work perfectly as an ingredient in any baking recipe. So, that’s the terroir of honey! We’ve spoken to many people in the past who insist they don’t like honey, but that’s as they’ve not tried enough. Imagine if the first cheese you tried as a child were a strong blue cheese. There’s a chance that would put you off cheese for life. However, if you were to try a milder cheese like mozzarella, you may find that you do in fact like certain types. Honey is no different. If you think you don’t like honey, try a different type, from a different region perhaps. You may well be very surprised! And if you find you prefer darker honeys, to our Three Foragers raw honey, don’t worry - we won’t be offended, just don’t tell the bees - shh!